An international team of scientists, including ones from the University of Exeter, the Institute for Systems Engineering and Computers, Microsystems and Nanotechnology (INESC-MN) in Lisbon, the Universities of Lisbon and Aveiro in Portugal and the Belgian Textile Research Centre (CenTexBel) designed a new technique for embedding transparent and flexible graphene electrodes into fibers commonly used in the textile industry. This could lead the way to creating wearable electronic devices such as clothing containing computers, phones and MP3 players, which are lightweight and durable. The scientists state that the possibilities for its use are endless, including textile GPS systems, biomedical monitoring, personal security or even communication tools for the sensory impaired. In this work graphene was created by chemical vapor deposition (CVD) onto copper foil, using a state-of-the-art nanoCVD system. The team used a technique to transfer graphene from the copper foils to a polypropylene fiber already commonly used in the textile industry. 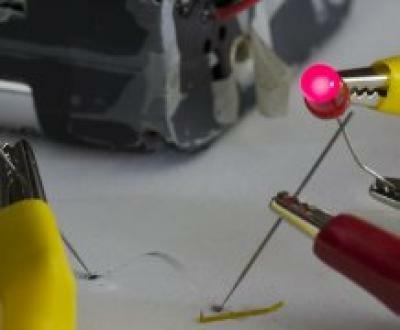 The scientists needed to address the issue of wiring, and developed a methodology of preparing transparent and conductive textile fibers by coating them with graphene, which may now pave the way to the integration of electronic devices on these textile fibers.